Our Program Partner, the Pisinemo Senior Center, has consistently participated in many of the yearlong services offered by SWRA. 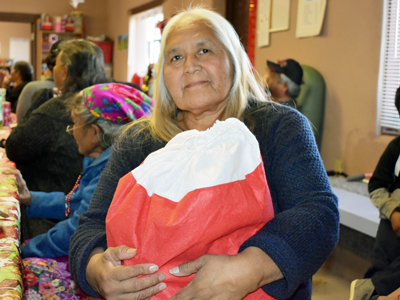 We enjoyed handing out Elder Bags and visiting with everyone during their recent holiday celebration. Two Elders in particular shared some of their life stories with us. Carmen liked the hand sanitizer and cleaning supplies, and was extra grateful for the Elder Bag. Carmen has lived in Pisinemo most of her life and attended public school in Eloy, Arizona, which was about 90 miles northeast. Her parents passed away in 1986, but all her surviving family lived in Pisinemo. 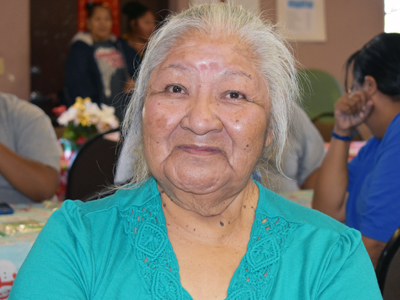 She visited the Pisinemo Senior Center about three times a week and liked all the variety of activities they provided: walking, exercise activities, games, and all sorts of arts and crafts. She loved to socialize with her friends and her favorite activity was cross-stitching. She said, “I was so glad when they taught everyone at the center to do the cross-stitching, especially the picture frame cross-stitch.” She proudly pointed to the picture frame cross-stitching on display in the center. Carmen really appreciated the incentives from Southwest Reservation Aid (SWRA), a program of Partnership With Native Americans. She liked the hand sanitizer and cleaning supplies, and was extra grateful for the Elder Bag. When we asked about one favorite Christmas memory, she had many because Christmas meant that her family would all gather to eat. She didn’t really have a favorite recipe, but enjoyed turkey with all the trimmings — as well as tamales and menudo on New Year’s Day! Carmen commented how the community had a preferred color to wear, which was purple. She did not know why purple was the color of the community, but proudly wore the color prominently. She had a lot of life in her and was very happy to be where she was. Thelma had been enjoying retirement — A LOT! Thelma had lived in Pisinemo her entire life and did her best to visit the senior center more than once a week. Like Carmen, she wasn’t able to pick one favorite Christmas, because the holidays meant her entire family would gather together to celebrate. Thelma has been retired for five years, but used to work at the livestock complex in Sells, AZ, a southern community of the Tohono O’odham reservation. She decided to retire after the company brought in computers and didn’t offer training. She felt intimidated and could not keep up with the modern technology brought into the company. The flip side was that she had been enjoying retirement — A LOT! When asked about a favorite recipe, Thelma didn’t really have one to share. She shared that she enjoyed cooking turkey, stuffing, cranberry sauce, and all the other holiday foods. The senior center activities she enjoyed most were the group walks and crocheting. As Carmen did, Thelma also voiced her gratitude for the incentives provided, especially since she didn’t have a way to get everyday necessities like toilet paper and paper towels on her own. She appreciated the Elder Stocking very much. We truly appreciated the time with Thelma as she radiated joy inside and out and was living in peace with those around her. It was truly an honor to visit with Carmen and Thelma, as well as the other participants at the center. We enjoyed learning a little more about their lives in Pisinemo and admiring all the various crafts. Most of all, we loved seeing their faces light up as they talked about how much they appreciated the gifts and their enjoyment of the fellowship.